(Nanowerk Spotlight) An increasing number of companies is involved in commercializing graphene on an industrial scale although the high cost of graphene is one of the major obstacles to its widespread adoption for commercial applications. Technology consultants Future Markets, for instance, estimates that the production volume of graphene in 2010 was 28 tonnes (mostly graphene nanoplatelets and graphene oxide) and is projected to grow to 573 Tonnes by 2017. They write that "Within the last year couple of years graphene producers have increased production capabilities considerably. XG Sciences, Angstron Materials and Vorbeck have increased, or are planning to increase, their production capacities and other large materials companies are getting in on the act. Producers are generally small, start-up companies who have witnessed an explosion in demand for their materials from a variety of industries. 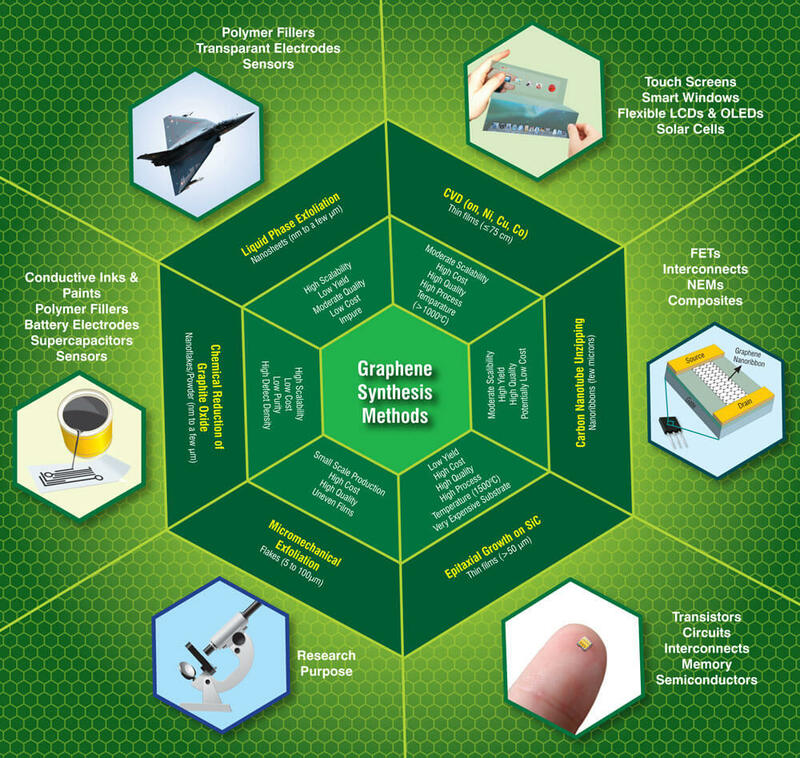 Companies such as Phillips, Nokia, IBM and Samsung are pursuing applications for graphene in electronics and optics. Near-term demand is for composites and coatings for application in the automotive, plastics, coatings, construction, metals, batteries, aerospace and energy markets." Currently, the most common techniques available for the production of graphene are shown schematically below, which includes micromechanical cleavage, chemical vapor deposition, epitaxial growth on SiC substrates, chemical reduction of exfoliated graphene oxide, liquid phase exfoliation of graphite and unzipping of carbon nanotubes. However, each of these methods can have its own advantages as well as limitations depending on its target application(s). In order to surmount these barriers in commercializing graphene, concerted efforts are being made by researchers at various R&D institutes, universities and companies from all over the globe to develop new methods for large scale production of low-cost and high quality graphene via simple and eco-friendly approaches. A previous Nanowerk Spotlight last year ("Mass production of high quality graphene: An analysis of worldwide patents") has carried out an extensive survey and analysis of global patents pertaining to the various processes of graphene synthesis. 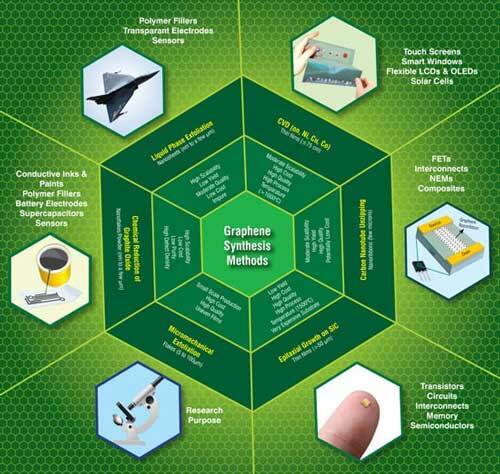 The article summarizes the current status of the conventional approaches for the synthesis of graphene based on the survey of literature. Please let us know if you want to suggest a new or modify an existing link.